It was good to learn on Wednesday morning that the Taliban had announced a formal end to their siege of Kunduz in Afghanistan. “The Islamic Emirate considered it in its best military interest to fortify its trenches surrounding the city rather than keeping the city, which would result in casualties to the mujahedeen and unnecessary waste of ammunition,” the group noted in a statement posted on its website. The 15-day skirmish between Taliban fighters and Afghan security forces, buttressed by NATO air support, shredded the heart of Afghanistan’s fifth-largest city and turned the northern Afghan city into a war zone reminiscent of something out of late-2001. Indeed, the siege marked the Taliban’s first successful seizure of a major Afghan city since the U.S. invasion in 2001–an ominous milestone as the United States continues to draw down in the country, leaving its future security in the hand of Afghan forces. The Kunduz saga revealed quite a bit about the state of Afghanistan today and about what it’ll take to keep the country from sliding out of the grasp of the Ghani-Abdullah unity government in Kabul. First, Kunduz shows that those of us, myself included, who saw the “succession crisis” this summer, after confirmation that Mullah Omar had been dead for over two years, as foreshadowing a broader crisis for the Taliban were wrong. Mullah Mansour, Omar’s right-hand man and now the Taliban’s new Amir al-Mumineen (Commander of the Faithful), is proving as potent a leader as any. Additionally, the recent offensive in Kunduz showed that Mansour’s Taliban have managed to rally militants originating from outside the group’s traditional Pashtun base. With Tajiks, Uzbeks, and even Shia Hazaras among militant ranks, the Taliban is showing a new sort of ethnic versatility that may give it an additional edge in Afghanistan’s traditionally Pashtun-light north. Even when the group ruled the country pre-2001, it ruled over these groups with an iron fist. 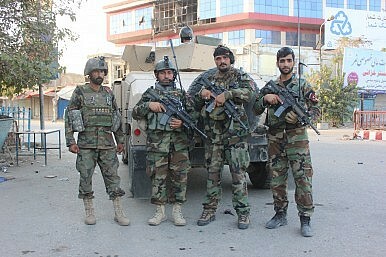 Second, the 15-day siege of Kunduz emphasized the extent to which the Afghan security forces were ill-equipped to handle the sort of protracted urban combat necessary to retake a major city. Granted, Kunduz shouldn’t have fallen in the first place, but it’s highly likely that without NATO air support and coordination, the battle to retake the city would have lasted longer. As my colleague Franz-Stefan Gady wrote after the start of the Afghan National Army offensive, the initial hours of the government-led offensive were marred with disarray, confusion, and poor planning. Of course, some of the issues Afghan forces had came down to chronic governance issues like poor infrastructure, but the overall organization of the campaign was a jumble. Afghan soldiers certainly fought valiantly for control of the city, but both civilian and military casualties could have been reduced with better planning. Third, the Kunduz saga has thrust Afghanistan back onto the U.S. foreign policy radar. With the conclusion of last year’s Bilateral Security Agreement (BSA) after defusing the Ghani-Abdullah electoral dispute, the Obama administration was ready to wash its hands of America’s longest war and leave Afghanistan to the Afghans eventually, with a small residual training and counter-terrorism force lasting through 2017. Now the administration is reconsidering the pace of U.S. withdrawal, not content to declare its investments in Afghan security a sunk cost. Kunduz isn’t the only factor driving this conversation in Washington: with the Islamic State and al-Qaeda both finding haven in Afghanistan, not just along the porous Pakistani border but across the country, the very objective that drove the 2001 invasion stands unaccomplished. Terrorists who would target the U.S. homeland have come to make the Afghan hinterlands their domain again. There’s no doubt the Kunduz episode will open a broader conversation in Kabul and Washington about how the Taliban threat ought to be assessed an countered. The Taliban have weathered what was supposed to be a crisis of leadership and come out guns-blazing, highlighting serious shortcomings in the coordination and planning abilities of the Afghan military. Meanwhile, Washington is set to reopen the Afghan file, reassessing its withdrawal plans. Note: A few hours after I wrote this, the Obama administration announced major changes to U.S. troop withdrawal plans from Afghanistan. 2016 was a difficult year for Afghanistan and 2017 presents unique challenges.